Anna Fisher, a member of NASA’s first astronaut class to include women and the first mother in space, has retired after more than three decades of service to the agency. Fisher was a mission specialist on Space Shuttle mission STS-51A, the second flight of the orbiter Discovery, which launched from Kennedy Space Center, on November 8, 1984. Fisher was assigned to her flight two weeks before delivering her daughter and flew in space when her daughter was just fourteen months old, making her the first mother in space. Fisher logged a total of 192 hours in space. Fisher was born in New York City, but considers San Pedro, California, to be her hometown. She holds a doctorate in medicine from the University of California, Los Angeles, and was selected by NASA to be an astronaut in 1978. She joined five other women as the agency’s first female astronauts. During her shuttle mission, Fisher and her crew deployed two satellites: Canada’s Anik D-2 (Telesat H) and Hughes’ LEASAT-1 (Syncom IV-1) and operated the Radiation Monitoring Equipment (RME) device and the 3M Company’s Diffusive Mixing of Organic Solutions (DMOS) experiment. As the first space salvage mission, the crew also retrieved the Palapa B-2 and Westar VI satellites for return to Earth. Fisher was assigned as a mission specialist on STS-61H that was planned in 1986. The mission was cancelled following the Challenger accident, so Fisher resumed technical assignments in the Astronaut Office. 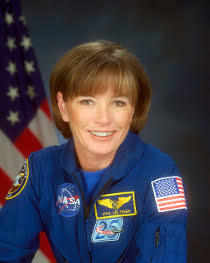 She served on the Astronaut Selection Board for the 1987 class of astronauts and in the Space Station Support office, where she worked part time in the Space Station Operations branch. Fisher also was the crew representative supporting space station development in the areas of training, operations concepts and the health maintenance facility. From 1989 through 1995, Fisher was on a leave of absence from the Astronaut Office to raise her family, returning in January 1996. From 1996 through 2002, during the early phase of building the International Space Station, Fisher was the chief of the Space Station branch. In that capacity, she coordinated inputs to the operations of the space station for the Astronaut Office, working closely with the international partners and supervising assigned astronauts and engineers. Fisher played an important role in building the foundations for the International Space Station Program, which is advancing scientific knowledge and demonstrating new technologies, making research breakthroughs not possible on Earth that will enable long-duration human and robotic exploration into deep space. From January 2011 through August 2013, Fisher served as an ISS Capsule Communicator (CAPCOM) working in the Mission Control Center and was the lead CAPCOM for Expedition 33. Most recently, Fisher was a management astronaut, working on display development for Orion, NASA’s new spacecraft which will take astronauts farther into the solar system than ever before. Fisher is retiring to spend more time with her family, including her daughters, Kristin and Kara Fisher.